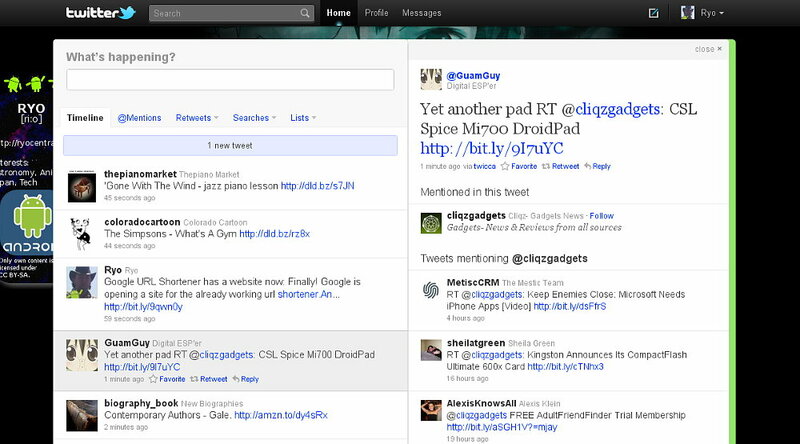 A few days ago, I got access to the new Twitter-design which is in currently in beta. The overview and the integration of pictures and video directly in the view is a big improvement. The speed is really good. I wouldn't have expected this. And so some tools will be obsolete for most of the users, I think. 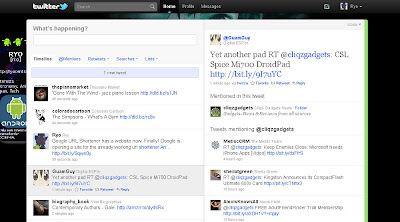 No, not software like Tweetdeck or Seesmic, but for the small clients, which did just that what the new site does. Making it a little more comfortable to check the tweets and putting media inline. Although there are some work to do. Links to pictures and videos are only showed inline when linking directly. Ping.FM e.g. does not work. No preview. Same with some shorten URLs. This needs to be fixed. You also can see in the screenshot, the old backgrounds won't show up correctly. This is no bug, but they changed the complete layout course. Now more of the screen will be used. Unfortunately it's dynamic, and not fixed. So while users with big browser windows might see some 100 pixels on the left side, other will only have less than 100px. Overall this is not going to stop me from posting with Ping.FM. But to check the tweets, I'll think I will use this more often.